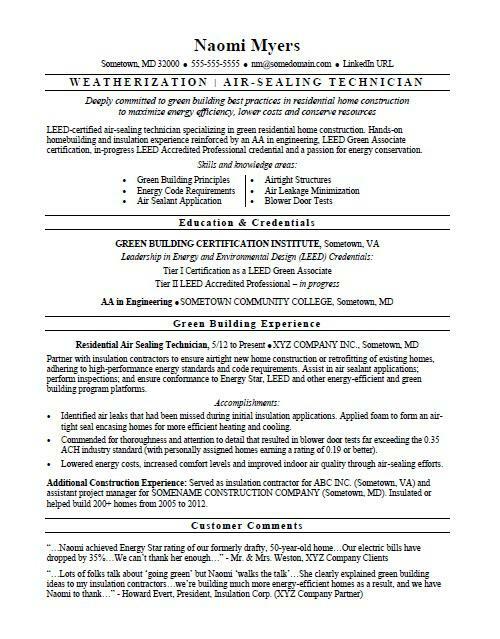 Check out this sample resume for an air sealing tech to get inspired for your green job search. Green jobs are expected to grow in the coming years. To see how to make your resume stand out to hiring managers, view the sample resume for an air sealing technician below and download the air sealing technician resume template in Word. And if you need more help, get a free resume evaluation from the experts at Monster's Resume Writing Service. Additionally, you can learn more about maintenance careers on Monster. LEED-certified air-sealing technician specializing in green residential home construction. Hands-on homebuilding and insulation experience reinforced by an AA in engineering, LEED Green Associate certification, in-progress LEED Accredited Professional credential and a passion for energy conservation. Partner with insulation contractors to ensure airtight new home construction or retrofitting of existing homes, adhering to high-performance energy standards and code requirements. Assist in air sealant applications; perform inspections; and ensure conformance to Energy Star, LEED and other energy-efficient and green building program platforms. Identified air leaks that had been missed during initial insulation applications. Applied foam to form an air-tight seal encasing homes for more efficient heating and cooling. Commended for thoroughness and attention to detail that resulted in blower door tests far exceeding the 0.35 ACH industry standard (with personally assigned homes earning a rating of 0.19 or better). Lowered energy costs, increased comfort levels and improved indoor air quality through air-sealing efforts. Additional Construction Experience: Served as insulation contractor for ABC INC. (Sometown, VA) and assistant project manager for SOMENAME CONSTRUCTION COMPANY (Sometown, MD). Insulated or helped build 200+ homes from 2005 to 2012.